When a historian says "Waterloo", do you automatically think of Abba? Do you wonder how Neville Chamberlain failed to realize that Hitler was a baddie when the Fuhrer was so clearly wearing a Nazi armband? And why did the Normans fight the Saxons at a place called "Battle"? Did they just see the road signs and think that's where they were supposed to go? Packed with great characters trapped in impossible dilemmas, this true-life drama will have you on the edge of your seat, thinking "I wonder which of them dies at the end?" (Well, they all do obviously. It was ages ago.) As entertaining as a witch burning and a lot more laughs. If only there was a book like this when I did history I may have taken note. Many a true word spoken in jest and despite some wonderfully funny observations there is a subtext of tragedy at mans ineptitude. Can?t rate it highly enough. “Patriotism is not enough.” said Edith Cavell. She was right. A sense of humour is one of God’s greatest gifts to humanity, and the ability to laugh at one’s own absurdity might have prevented much carnage. O’Farrell reminds us that, while Hitler and Mussolini became dictators, Britain (Daily Mail excluded!) just laughed at Oswald Mosley. If more folk had laughed at UKIP and Trump, we’d not be in such a mess now, on the brink of Brexit, with a superpower governed by tweets. Would you consider the audio edition of An Utterly Impartial History of Britain to be better than the print version? No unfortunately the abridged version is like star wars without stars or even wars. I love the quirky narrative that will make you laugh time and time again. I think the author narrating the book is perfect and should be standard with exeptions obviously. EG phillip carlos, may he rest in peace. I love this book. It covers the whole of our history, but without me falling asleep once! It's very difficult to keep up with all the changing of dynasties and ages that went on in our past, but this book manages it, and throws in modern comparisons that make you smile, and make it all make sense. I haven't heard the audio version of this but I have read the book and I think it's fantastic. Insightful, enlightening, informative and above all entertaining; John O'Farrell has brought all his wit and human insight to bear on the chequered history of these fair isles. In respect to the previous reviewer?s points, I realise that everyone is entitled to their own view and certainly humour is subjective but to say that John O'Farrell has no aptitude for humour is largely unfair. I'd recommend you look up his fiction books such as \"May Contain Nuts\" and \"The Best A Man Can Get\" as well as his collections of writings for various newspapers to get a real insight in to just how much aptitude this man does have for humour. 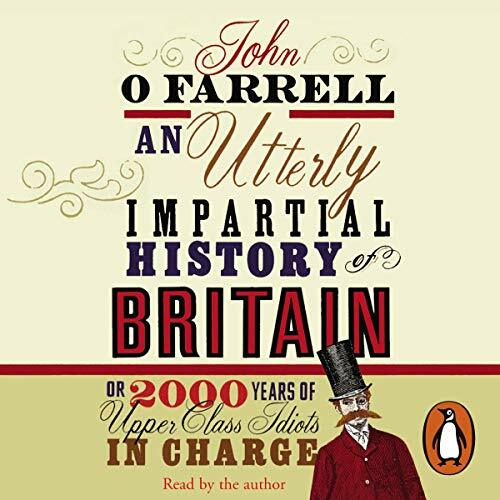 John O'Farrell is clearly a fine historian with a wonderfully sharp eye for ferreting out facts and key events that are not only important but interesting. His 'Utterly Impartial History' is potentially a superb narration of how Britain (well, mainly England) began as a small island beset by invaders and warring chieftains and has become, 2000 years later, a democracy that perhaps more than any other manages to balance social justice and individual liberty - all without the bloody popular uprisings that have characterised most other countries' journey towards the same goal. But only potentially superb. If only someone - presumably his publisher - hadn't persuaded him to make this fascinating story more 'accessible' by stuffing it with anachronistic jokes and satirical asides. Unfortunately Mr O'Farrell has no aptitude for humour: his jokes are mostly feeble and his satire as heavy-handed as an undergraduate revue. As a result he resembles nothing so much as one of those teachers who desperately seek to ingratiate themselves with their students - who rightly despise them as patronising. Let's hope that one day he will have the courage to give us this remarkable and inspiring story straight, no frills. If he does, it will become the classic short history of a remarkable people.